My boys love fish sticks but I hate how unhealthy they are and do you really know what kind of fish they are? Well my solution was to make my own... kinda. This is so easy and it turned out really good. I don't know if I make tartar sauce the "right" way but I've always made it this easy way and it's so good. Preheat the oven to 350 F. While you are waiting for the oven to preheat start your rice and cook according to the package instructions. Take your flour, salt, pepper, garlic powder, and Panko and mix a reasonable amount onto a small plate. Sorry I didn't measure this out, seeing as I can usually eye ball how much I will need and you can always just add more. In a shallow bowl have your egg white. Dry your talapia really well with a paper towel so the egg white will stick. Grease a small baking dish, big enough for your talapia filets. Take your talapia and coat it really well with the egg white and then place it in the flour mixture and coat really well. 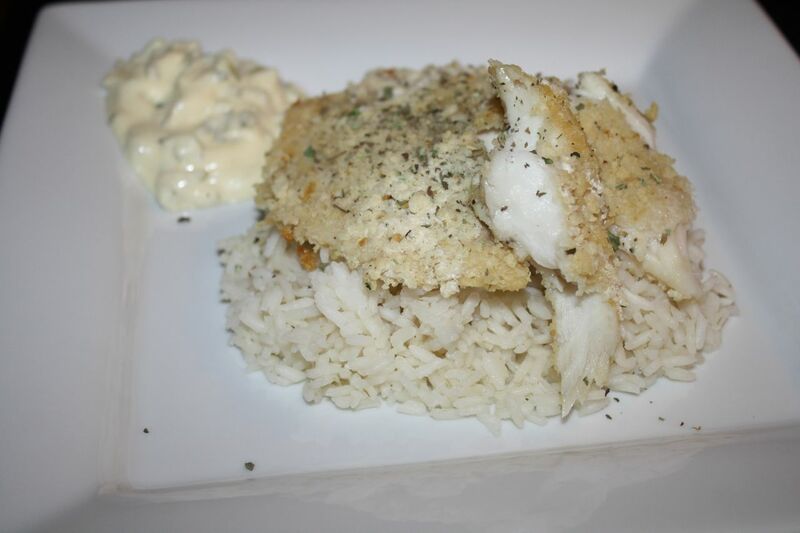 Move to baking dish and continue with the rest of your talapia. Once the fish is in the baking dish use cooking spray (try to use the olive oil one) and spray the battered fish down so it looks damp and you can't see the dry flour. Place fish in the oven at 350F for about 15-20 minutes. It will be done when the fish is white and flakes apart easily with a fork. Now the easy part. 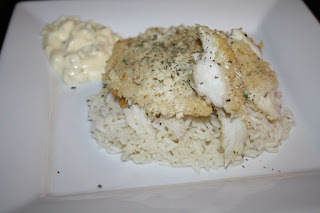 I can't believe how easy it is to make tartar sauce. Take a couple small dill pickles and chop them up finely. Mix the chopped pickles with a couple tablespoons of mayonaise. You can judge the amount by simply looking to the consistency of tartar sauce. There you go, it's as easy as that and I think it tastes exactly the same and way cheaper.